SUNFLOWER V SQUARE is the painting that makes everyone smile. Can you look at a Sunflower without smiling? I love painting Sunflowers. They do make me smile, and so every year I try to paint at least one new Portrait of a Sunflower. 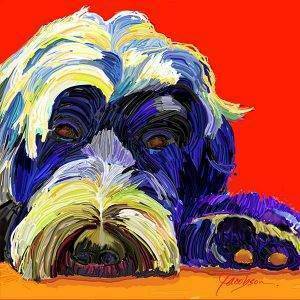 This years art print is from the Watercolor Group of art prints by California artist…Jackie Jacobson. “I’ve looked for a way to add watercolor painting to my artwork.” Here it is, in this new group of art prints by artist Jackie Jacobson. Sitting on a watercolor painting background are the square tile looking art prints. The inspiration came from the new tile art coasters. The beauty of vibrant color against the subtle watercolor background, brings these paintings into a new dimension.